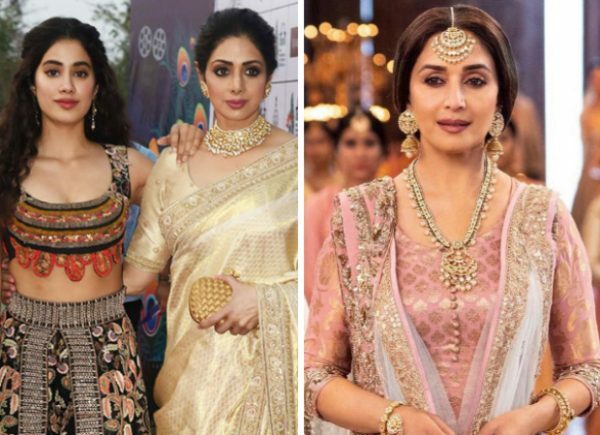 It is known that the late actress Sridevi was supposed to star in the period drama Kalank. But, due to the untimely passing of the star, Madhuri Dixit stepped into her role of Bahaar Begum. Janhvi Kapoor was one of the first ones to congratulate the actress and had even shared a photo of her mom and Madhuri together. As the teaser and first song are out, Janhvi was recently asked how she feels about watching Madhuri Dixit in Sridevi’s role. Janhvi Kapoor recently attended HELLO! Hall of Fame Awards 2019 where she released that she is looking forward to seeing Madhuri Dixit. “I was excited to see her in Kalank from the audience point of view. I think teaser of ‘Kalank’ and every character’s look in the film is looking really beautiful so, I am really excited to see that film,” added Janhvi. It brings together an ensemble cast including Varun Dhawan, Alia Bhatt, Sonakshi Sinha, and Aditya Roy Kapur. The film also marks the return of Sanjay Dutt and Madhuri Dixit together after 21 years. Presented by Fox Star Studios, Kalank, produced by Dharma Productions and Nadiadwala Grandson Entertainment, will release on April 17. Watching Varun Dhawan and Nora Fatehi groove to Dilbar is making our Tuesday better!